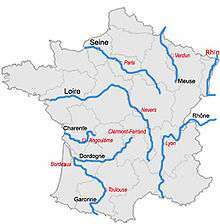 This is a list of rivers that are at least partially in France. The rivers are grouped by sea or ocean. The rivers flowing into the sea are sorted along the coast. Rivers flowing into other rivers are listed by the rivers they flow into. Some rivers (e.g. Sûre/Sauer) do not flow through France themselves, but they are mentioned for having French tributaries. They are given in italics. For clarity, only rivers that are longer than 50 km (or have longer tributaries) are shown. In French, rivers are traditionally classified either as fleuves when they flow into the sea (or into a desert or lake), or as rivières when they flow into another river. The fleuves are shown in bold. For an alphabetical overview of rivers of France, see the category Rivers of France. The rivers in this section are sorted north-east (Netherlands) to south-west (Calais). The rivers in this section are sorted east (Calais) to west (Brest). The rivers in this section are sorted north (Brest) to south (Spain). The rivers in this section are sorted west (Spain) to east (Italy). The rivers in this section are counter clockwise along the Corsican coast starting from Cap Corse.